Dressed in robes for a journey, with a fan for understanding and a sack to collect insights and dispense gifts, Spiritual Journey Buddha travels the country and spreads joy, prosperity, and happiness wherever he goes. Happiness in one of Buddha’s greatest gifts. He reminds us to always keep our sense of humor, even in times of trouble. 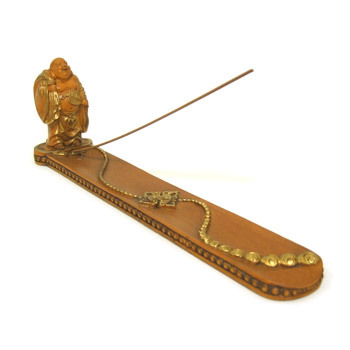 He waits to hold your incense for you.